Hawley Beach proved to be a run on Virgin Territory. We saw parts of Hawley that developers had obviously not found yet. Trail was well laid with ample flour. According to Dint ants were seen hoisting flags on top of some of them trying to claim what appeared to be reclaimed land. TruckFucker made sure we weren't going to get cold and preheated coals to put into the fancy clay patio heater on the deck. 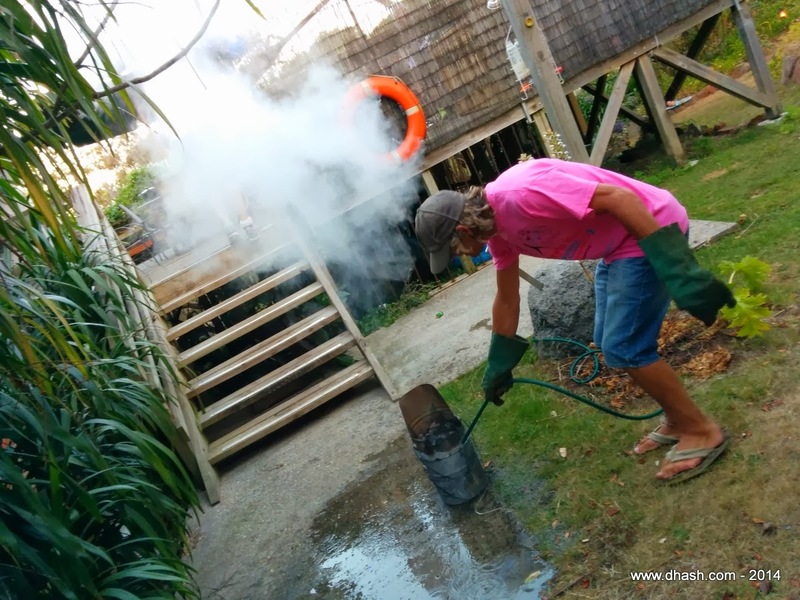 In order to get the preheated coals up the steps he had to cool them down with water - as you do. High Beam had food for us all. Naturally the spa was one of the highlights of the evening, and was enjoyed by the majority. It was decided to pour a gallon of bubble bath in to cover our fat. Cheese ran off with the little booze left over and left us needy in the spa. When everyone had disappeared it turned out all the real men were still discussing the merits of a global lizard invasion in the man-cave downstairs where TF had his first prototype of the self-replicating pneumatic hydromatic invasive mechanical hybrid lizard.
. His other creations were hiding in the attic as they weren't save to turn on with strange humans like us. And the next run (630pm on Monday 3 March 2014) is set by GoneAgain from Moorland Beach, turn left at the old and now abandoned pulp mill, past the Devonport airport. If you can find the see from the beach, and could be bothered walking the hundreds of meters across it you can swim! Prepare for sharks, snakes and sand-flies. Fortunately the On-On is at FM's save haven at 10 James Street in town. Watch the guard dog, don't step on her! Oh, BYO Spa. Dogs welcome on Moorland Beach incidentally!